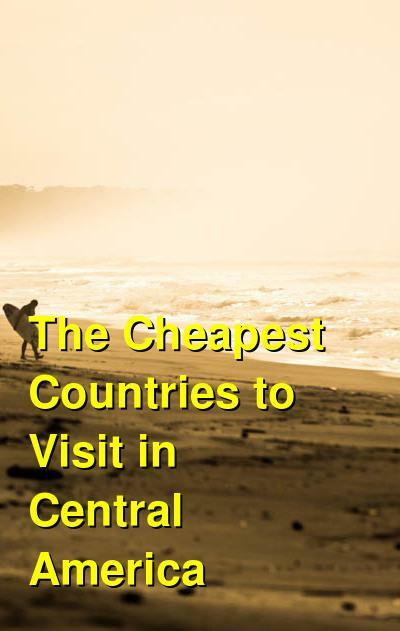 What are the cheapest and most expensive countries to visit in Central America? The following travel cost rankings for countries in Central America are calculated based on the travel budgets of real travelers. Also referred to as a Travel Cost Index, or a Backpacker Index, the countries below are in order from most to least expensive by their average daily travel price, per person, per day. What are the cheapest countries to visit in Central America? The least expensive countries for travel in Central America are currently Honduras ($28.87), Nicaragua ($33.84), and Guatemala ($35.95). What are the most expensive countries to visit in Central America? The most expensive countries for travel in Central America are currently Costa Rica ($69.12), Panama ($62.58), and Belize ($61.26). Central America is a thin strip of land that unites North and South America. It's location gives it many of natural advantages and makes it a great place to go for a unique vacation. Before the conquest by Europeans, important civilizations lived in the area and the structures that remain from their cities, religious centers, and roads make tons of impressive archaeological sites. Central America has an amazing, warm and humid weather all year long, which has allowed tropical forests to thrive. The region is also located in the abduction zone of two tectonic plates, giving the area tons of mountains and volcanoes covered with dense jungles. With all of this natural beauty, you can practice almost any adventure sport in the region. All of the countries of Central America have beaches. The largest ones even have beaches on both coasts. If you want white sandy beaches, relaxed waters, diving, and snorkeling, you will find Belize, Honduras, Costa Rica, Panama, and Nicaragua have great options. If you are looking for great waves to surf, Guatemala and El Salvador have the best spots. In the lakes, you can go kayaking, on boat tours, diving, snorkeling, swimming, and fishing. Many rivers are great for rafting and some form gorgeous waterfalls where you can enjoy rappelling. Its mountains and volcanoes offer challenging hikes and all of them provide great opportunities for wildlife and bird watching. Whether it is accommodations, food, and tours, the region offers an interesting mixture of some of the cheapest options you will ever find, upscale, five-star services and everything in between. Central America is certainly cheaper than the southern end of the Americas. With airlines flying direct from the US, you can often find yourself landing right in the heart of the continent for around USD$100. From here, it's easy to jump on the cheap local buses to navigate your way around, allowing you to immerse yourself in the Central American culture. Travel costs in Central America can vary quite a bit from one country to the next. Of course, people have different travel styles and varying expectations for comfort. Belize is mostly known as a luxury and cruise ship destination, with prices to match. That said, if you're just there to soak up the atmosphere, you can still travel in Belize on a modest budget. You can stay on the Cayes for a while and just enjoy the sunshine and the Caribbean vibe. Day-to-day travel costs like lodging and food are incredibly low in Guatemala, with dorm beds starting around $7 and a half-decent private room starting at $20. Meals are rarely more than a couple of dollars, though as always Western-style food is more expensive. Nicaragua ranks among the cheapest destinations in the world. Whether you're a shoestring traveler or just looking for good value, Nicaragua will be a great place to go. Travel costs in Honduras are at a similar level as Guatemala, Nicaragua and El Salvador. El Salvador doesn't have as many tourist activities as other nearby countries, though scuba diving and surfing are among the most common activities. Surfing lessons are typically around $15 or $20, while diving costs about $35 per dive. Costa Rica has the most firmly established tourism industry of Central America. It is known for its wildlife parks, eco-resorts, beaches, and adventure sports. Prices are relatively high as many tourists from the United States come to Costa Rica on vacation. This is not just a country for intrepid backpackers but also for honeymooners, families, fishers and birdwatchers, and US retiree expats. Most costs are about double that of neighboring Nicaragua. The cost of travel in Panama sits somewhere in the middle. While accommodation costs about as much as in Costa Rica, the tours and activities in Panama tend to be cheaper.